I told myself that I would not do tags for a little while after doing quite a few recently but I saw this on Oh! Leona which is one of my new favourite blogs and I thought I had to do it. I've mentioned my 2 adorable and fluffy cats on here before but I've never done this tag so it had to be done! I have no idea whether this is just a tag for dogs or not but I thought I'd do it anyway. 1. What is his/her name? 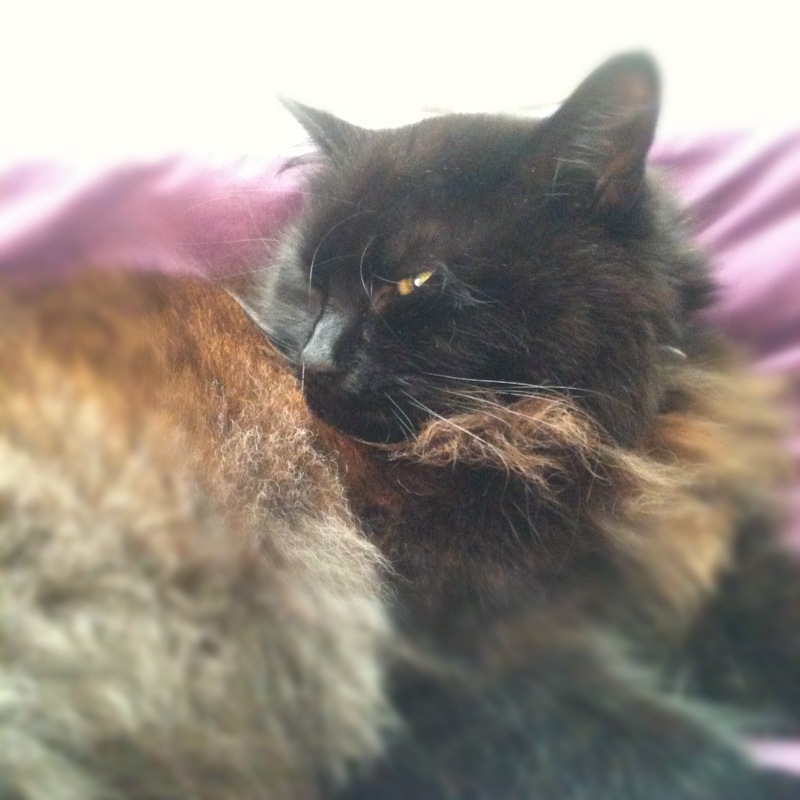 I have 2 cats, Bruiser who is a boy and very fluffy and Marmite who is a girl and is actually Bruiser's Mum! 2. When did you get Marmite/Bruiser? 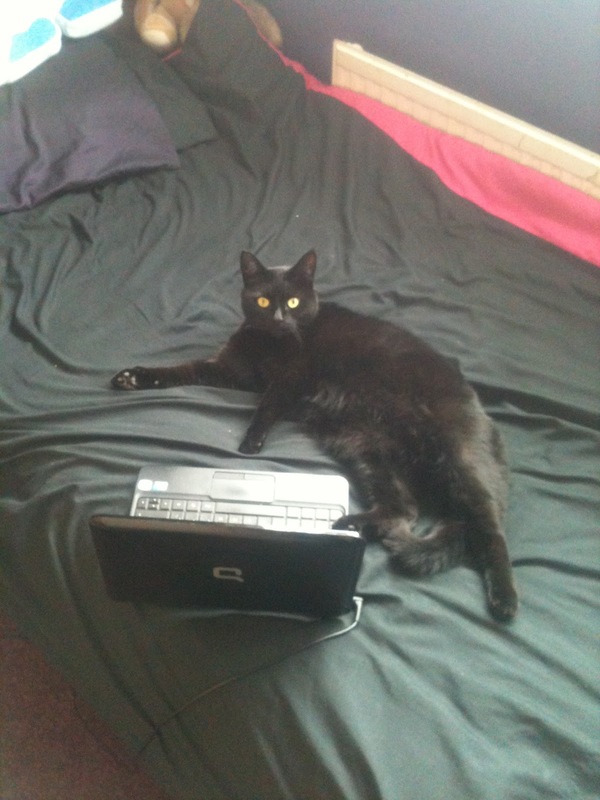 I'm pretty sure Marmite is about 5/6 years old now, we probably got her in 2009 or maybe 2008. We've had Bruiser since the moment he was born with his 3 brothers and sisters in our living room. 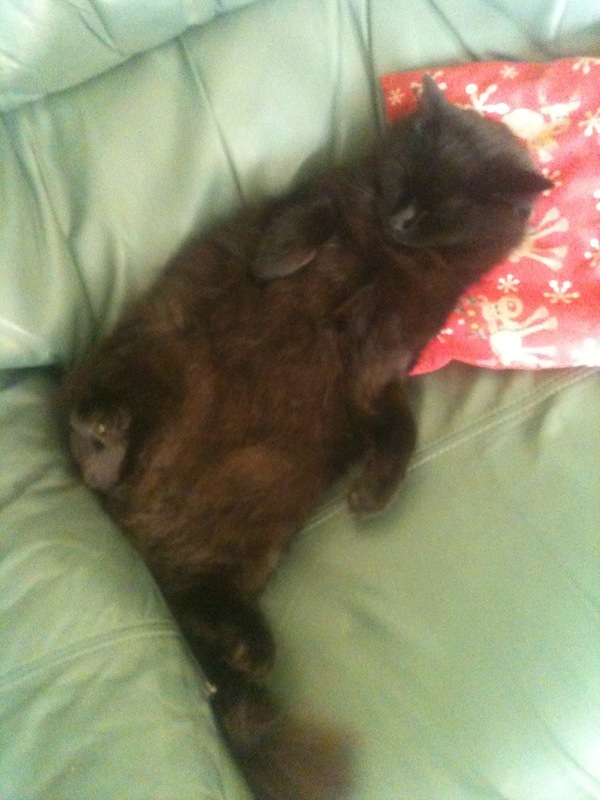 We had planned to get Marmite neutered but she had other plans and beat us to it by getting pregnant! He is 4 I think now. 3. What is something Marmite/Bruiser does that annoys you? Marmite has a habit of sitting on my chest as I'm about to go to sleep and as soon as I wake, I love her to bits but sometimes you just want to sleep haha! Bruiser is a bit more naughty and spends a lot of his time winding Marmite up, meaning I usually have to break up a cat fight! Or he'll bring some kind of animal into the house live, I know to him he is bringing us a present but come on, keep it outside! 4. What type of breed is Marmite/Bruiser? 5. Has Marmite/Bruiser ever had a near death experience? Marmite never has but Bruiser has unfortunately. About 2 or 3 years ago we were on holiday and our neighbours were looking after the cats, we came back and she said that she hadn't seen him for a day which is normal for cats, they can often disappear for days and come back fine. When he came back that day though he wasn't good and we are 100% sure that he had been hit by a car. We put ourselves in a lot of debt to care for him and get him back to full health but he is completely worth it because when you love your pet you'll do anything to keep them healthy and happy. 6. Does Marmite/Bruiser know any tricks? Unfortunately not, I know you can train cats but both of them are too lazy to do anything like that! 7. Does Marmite/Bruiser like to snuggle? Both of them spend a lot of their day craving attention from someone, trying to get as many hugs as possible! Marmite does this thing when the back door is open, if I go near it she races down to the grass and flops onto her side, her way of telling me that I must give her a belly rub! This has been happening every time I go to the back door recently as the weather has been nicer. Bruiser likes to snuggle but spends a lot of his time sitting underneath one of the radiators on his little throne (a big cushion). 8. Where did you get Marmite/Bruiser? We got Marmite from a family friend and Bruiser from Marmite! 9. Does Marmite/Bruiser get along with other cats? Nope. Nope. Nope. 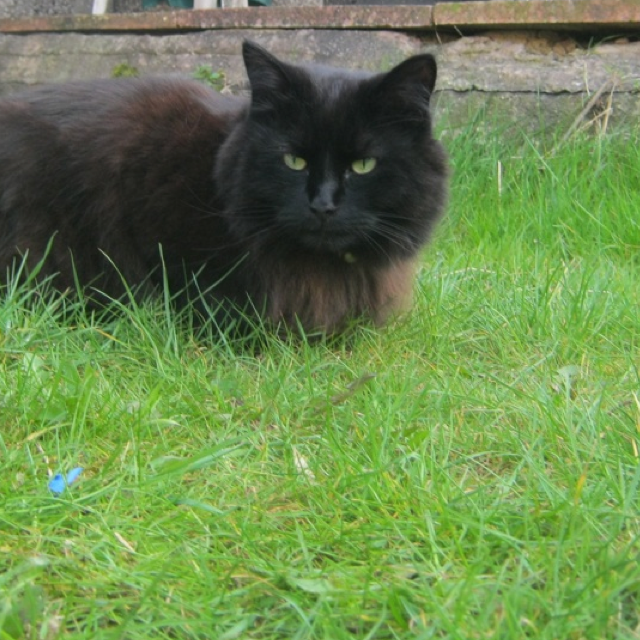 There are so many cats in our area meaning they all get into fights a lot, Bruiser and Marmite are both very keen on protecting their territory, it isn't as bad as it used to be though. 10. Does Marmite/Bruiser get along with strangers? Marmite is very shy and will run a mile when any one new comes into the house whereas Bruiser will investigate a little and end up making friends with anyone who comes into the house, he loves cuddles too much to be shy! 11. How much does Marmite/Bruiser weigh? 12. Do you ever dress Marmite/Bruiser up? 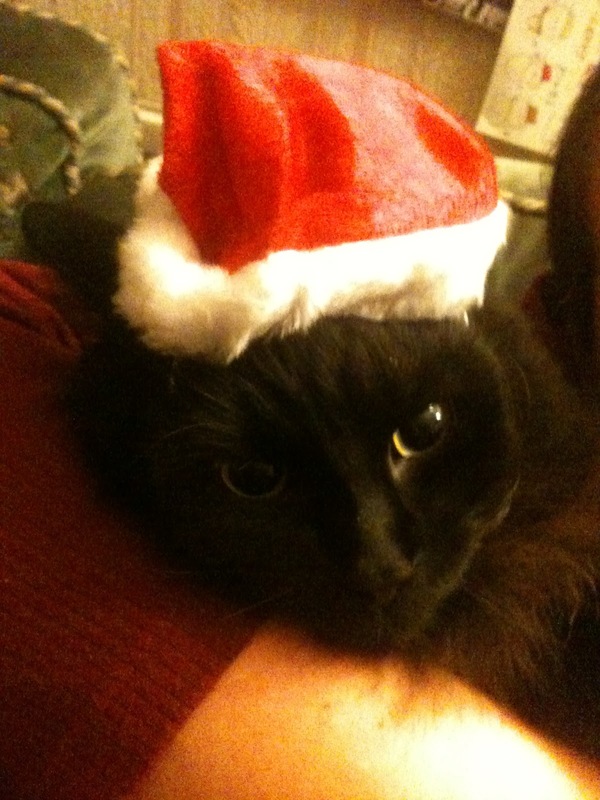 We have only done this once, they both have a little cat sized santa hat that comes out every Christmas! Marmite hates it but Bruiser doesn't mind it. 13. Has Marmite/Bruiser ever tried to run away? Nope! Do cats even run away? 14. How did you come up with Marmite's/Bruiser's names? My Mum chose Marmite's name as surprise surprise she loves Marmite and the name really suits her. My Dad chose Bruiser's name, not too sure why, but at first my Brother called him Theodore and I actually would have loved him to have been called that! 15. How much do they mean to you on a scale of 1-10? Definitely higher than 10, much much higher than 10. They both mean so much to me and I know some people think cats are boring but I don't know what I'd do without them. They are both such characters and they are a part of my family that I love very much! I tag anyone who has a furry friend to do this, mainly because I want to see all your cute pictures of them!